Don't Go Taking my Heart! Characters on the cover: Mom, Walt, Fry, Igner, and Larry. "Don't Go Taking my Heart!" is the sixty-ninth comic issue, released 23 October, 2013 in the US. Suffering from chest pains, Mom visits her doctor, who tells her that her heart is so weak she will need a heart transplant. She promptly goes to Applied Cryogenics with her sons, where it is revealed that she steals the organs/body parts of frozen people whenever she needs a replacement. However, the person she intended to steal her replacement heart from is Fry, who has already thawed out. Using the help of Terry, Mom manages to track him down. Meanwhile at Planet Express, the Professor gives out awards to the crew, when Mom arrives and informs Fry that he has won an internship at MomCorp (she also enlists Bender as an unpaid robot product tester). Later at MomCorp, Mom introduces Fry and Bender to her sons, then proceeds to watch Bender test products with Dr. Ogden Wernstrom. Fry manages to complete many tasks for Mom, and she sends him home after a successful first day, but warns him not to do anything to quicken his heart. The next day, Mom is shocked to discover interns only work on Mondays, Wednesdays and Fridays, and uses a "Find My Peon" app to check if Fry is still safe and on Earth. Fry is located making a delivery of 500 pounds of cheese to a planet inhabited by giant space mice, who are attacking the Planet Express ship, leaving him, Bender and Leela trapped inside. Mom teleports onto the ship, offering Fry a full-time job as her intern. He accepts, and Mom rescues both him and Bender, but promises Leela she will send crew replacements to rescue her. The replacements, much to Leela's dismay, are Gus and Dandy Jim. 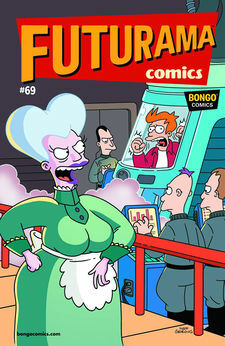 Over the next few weeks at MomCorp, Fry does many jobs for Mom, even going as far as to slap her sons for her. At a business meeting, Mom reveals that the company is ready to sell several new robot products, thanks to their new tester, Bender. Mom then asks to speak to Fry privately, telling him that she would like to adopt him as one of her sons so she can leave MomCorp to him when she passes away. She tells Fry that he has made her very happy, leaving him to think about the offer whilst she goes to a doctor's appointment. Before she leaves, Walt, Larry and Igner notice Mom smiling, and realising something is wrong, decide to do something about Fry. At her doctor's appointment, Mom is told that her heart is even healthier than before due to her love for Fry, adding 50 years to her lifespan. Later, back at MomCorp, Mom tells her sons to take Fry back to Applied Cryogenics and refreeze him for when she needs his heart again in the future (but secretly, she is very upset because she doesn't want to lose him). Mom's sons take Fry back to Planet Express instead, explaining to him that they were told to refreeze him, and also why Mom hired him in the first place. Before they leave, they ask Fry for tips on how to make her stop slapping them. The boys return to MomCorp, using the excuse that Fry escaped before they could get to Applied Cryogenics, but that they can kidnap him any time and refreeze him. Before she can slap them, they use Fry's tip and all give Mom a hug, angering Mom even more - but they refuse to let go. Bender: Yeah, yeah...moving along! Give out the "Bender is great" award already! I think I have a really good shot at winning it this year...unless Scruffy out-Bender's me again! Scruffy: You ain't the only one with dreams of killin' all humans. Zoidberg: I shall now do an interpretive dance of all of Hermes' insults to me over the past twelve months! Fry: Umm...how about we just say our names and nod politely? Bender: But where's the fun and internal bleeding in that?! Fry: I still don't know how you chose me, though. The last time I made a resumé, it was done in invisible ink and glitter. The doctor that examines Mom is a parody of the titular character of Dr. Seuss' book The Cat in the Hat. In the cover art, the end of Fry's sleeve is incorrectly colored white. Larry introduces himself to Fry as Walt. This is the first issue to be released after the end of the second run. The issue's title is a reference to the Elton John and Kiki Dee song "Don't Go Breaking My Heart". This page was last edited on 26 June 2015, at 21:05.